Beatmania II DX 18 Resort Anthem is a music video game and the 18th installment of Beatmania II DX series with a futuristic tropical resort setting. The interface making use of sleek mechanical components with simple whites and bright colors that are easy on the eyes. 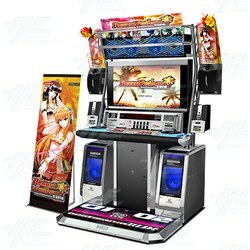 Changes to this addition include: - The song wheel is now circular rather than vertical, similar to the one on Dance Dance Revolution - More than 60 new songs - 2 new modes are presented; Premium Free Mode, a mode where the player plays for 8 minutes as opposed to 2 stages, and DJ Order Mode, a mode which is similar to pop'n music's Challenge Mode, where a player can select missions (similar to pop'n's Normas) and earn DELLAR POINTS. Resort Anthem only has one Extra Stage, making it the first to do this since Beatmania IIDX 12: Happy Sky. Also, players can get new songs through Beat Unlocks, JAPAN TOUR, WORLD TOUR and other unlocking events. This bright, tropical looking machine, will attract players from all across the floor with new songs, modes and stages to enjoy. Beatmania II DX 18 Resort Anthem is a music video game and the 18th installment of Beatmania II DX series with a futuristic tropical resort setting. The interface making use of sleek mechanical components with simple whites and bright colors that are easy on the eyes. 2 new modes are presented; Premium Free Mode, a mode where the player plays for 8 minutes as opposed to 2 stages, and DJ Order Mode, a mode which is similar to pop'n music's Challenge Mode, where a player can select missions (similar to pop'n's Normas) and earn DELLAR POINTS. Resort Anthem only has one Extra Stage, making it the first to do this since Beatmania IIDX 12: Happy Sky. Also, players can get new songs through Beat Unlocks, JAPAN TOUR, WORLD TOUR and other unlocking events. This bright, tropical looking machine, will attract players from all across the floor with new songs, modes and stages to enjoy. PLEASE NOTE: that this machine must be connected to the Japanese Server and you must pay a regular subscription fee in order for the machine to work. If you do not do this, the machine will not come on. Unfortunately this is not a service we can help with. If you do not have a solution for this, we recommend that you do not purchase this machine.